Manila, Filipinas– The sun breaks through the walls of Intramuros, it’s a normal weekday again inside the oldest district of Manila or should I say, the grand Manila that was. And I’m on my regular morning walks on its four century old calles. It’s 7 and I’m only a few yards away from my favorite destination. 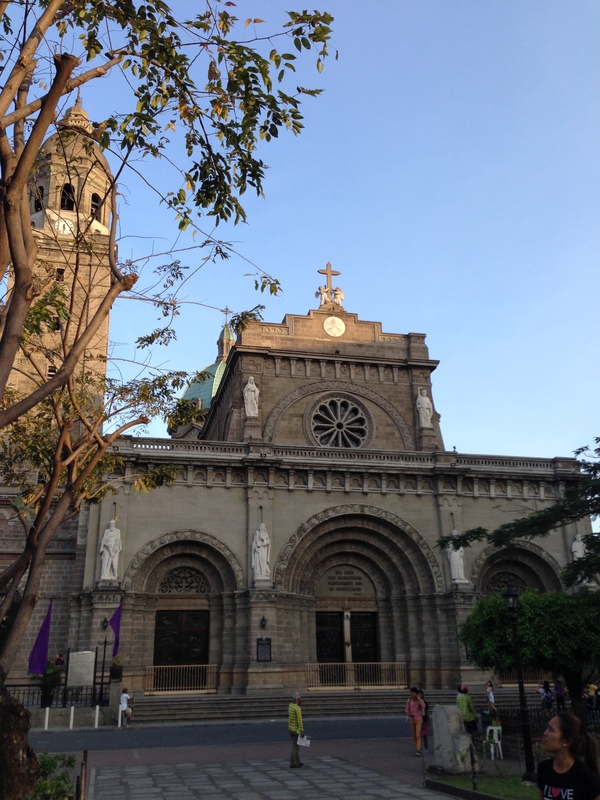 Located in front of Plaza de Roma, Catedral Basílica Metropolitana de Manila or Manila Cathedral Basilica stand as the seat of Roman Catholic Archdiocese of Manila and has the image of the Immaculate Conception, the principal patroness of the Philippines. 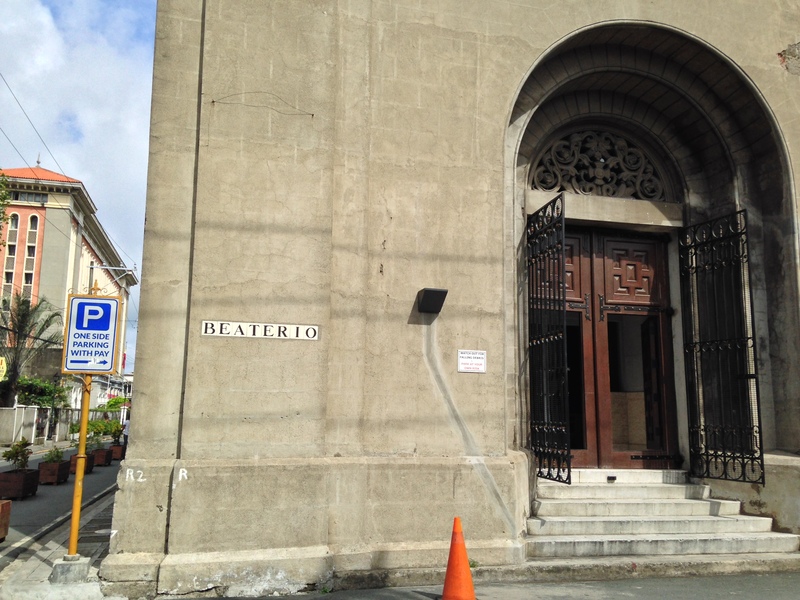 The current neo-classical church is the eighth church since it was built in 1581 where previous structures were severely damaged by major earthquakes and Japanese bombings during World War II in 1945. 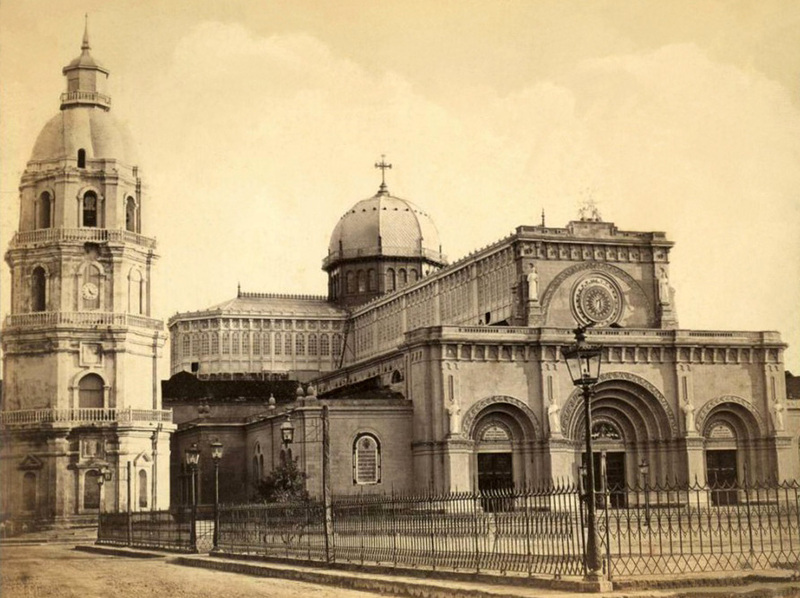 10 years after the disaster, they rebuilt it in 1954 to 1958 under Cardinal Rufino Santos and the supervision of Filipino architect Fernando H. Ocampo to what it is today. Since my first visit in Intramuros around 9 years ago, I easily become a fan of the cathedral. And the recent improvements done last 2014 highlighted its amusing architectural details. So I took some shots that will give you a bite of the grand structure of Intramuros. 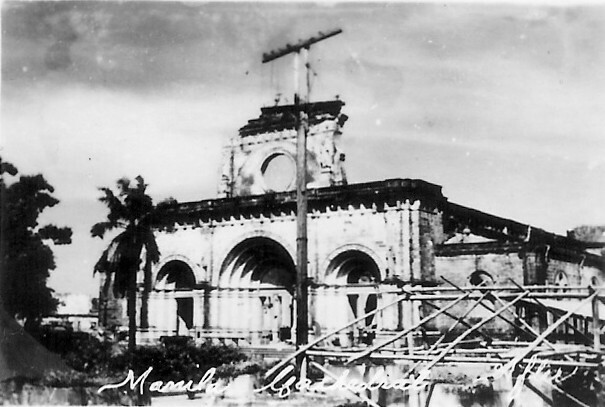 The ruins of Manila Cathedral after World War II. Photo by Google Images. Facade of Manila Cathedral and the lighted emblem of the Papal insignia. Shot from the back of the Cathedral, showing the patinated dome and its four-armed cross. 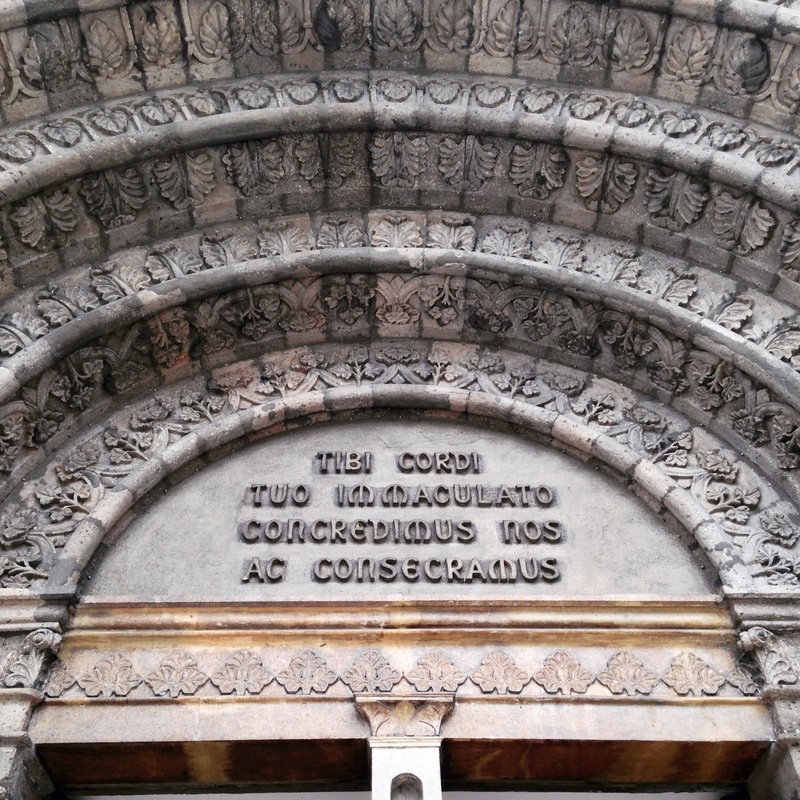 The façade (tympanum) of the cathedral bears a Latin inscription: Tibi cordi tuo immaculato concredimus nos ac consecramus (English: We consecrate to your immaculate heart and entrust to you (Mary) for safekeeping). 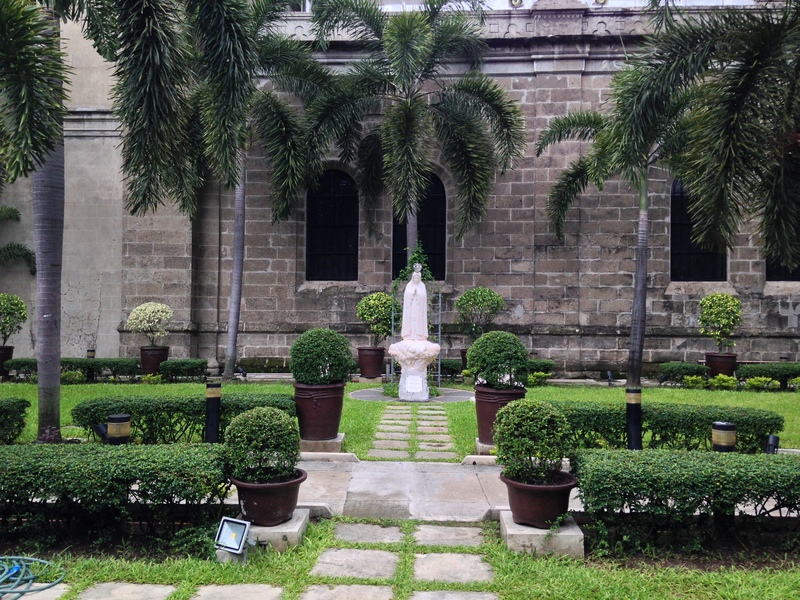 Our Lady of Fatima garden on the northern side of the cathedral. 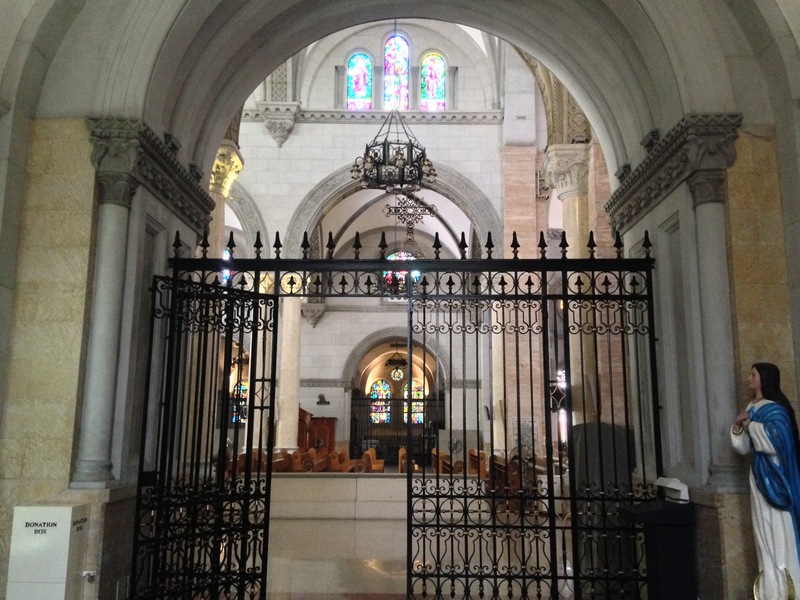 Entrance to the adoration chapel/St. Peter chapel at Calle Beaterio. The well lit Manila Cathedral at night. 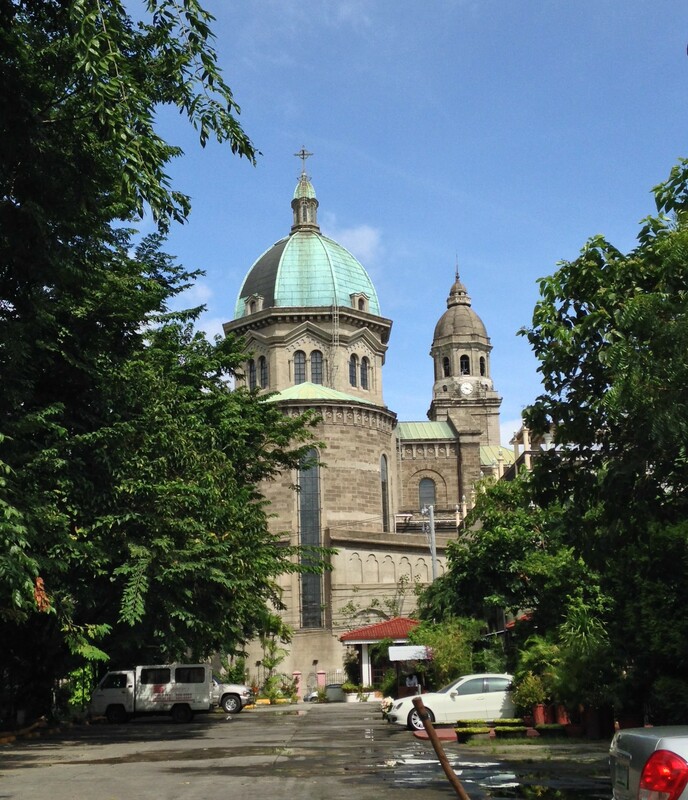 Photo by: Manila Cathedral-Basilica website. Shot from the left nave showing the vaulted ceiling, St. Peter’s image, well lit interior and recent improvements in the cathedral. 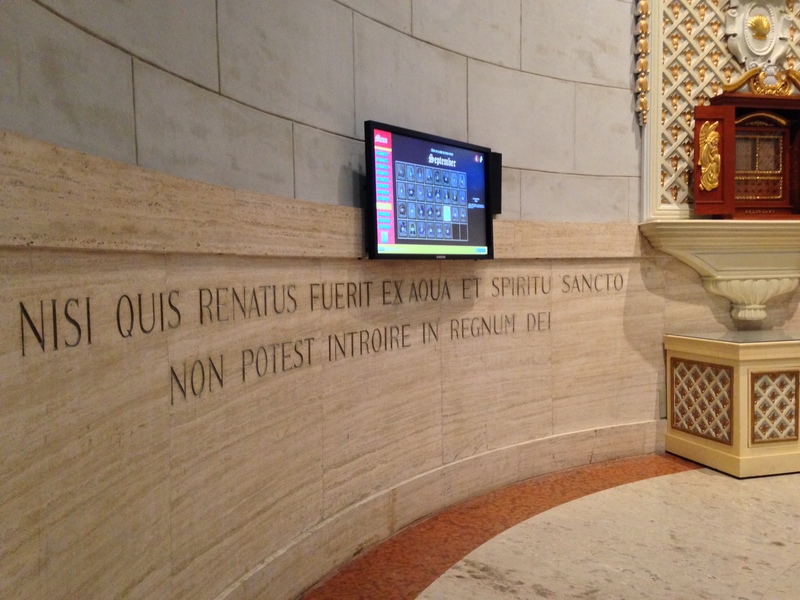 The Baptistry of St. John the Baptist is found at the left side of the vestibule from the side entrance. The baptismal font in bronze is the work of Publio Morbiducci. 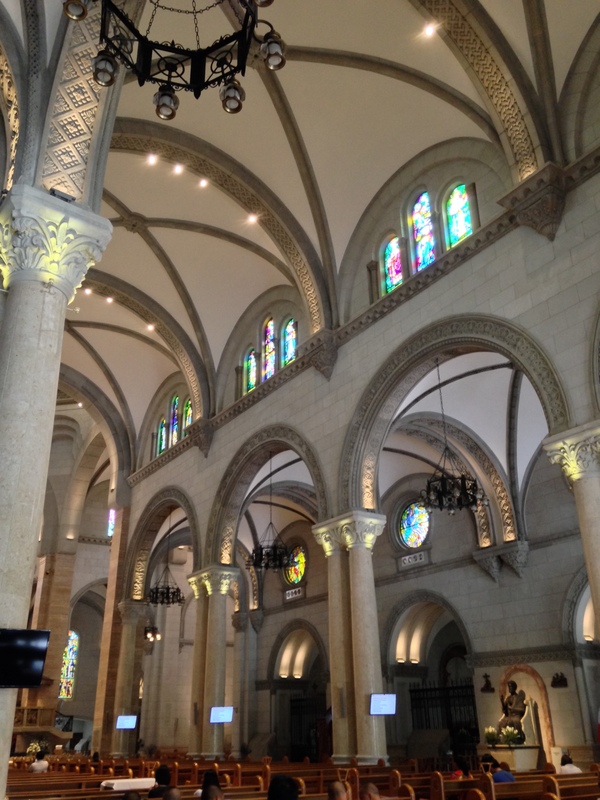 Over the font is the sculpture of Jesus being baptized by St. John. Regular baptisms at the cathedral are usually held here every Sunday. 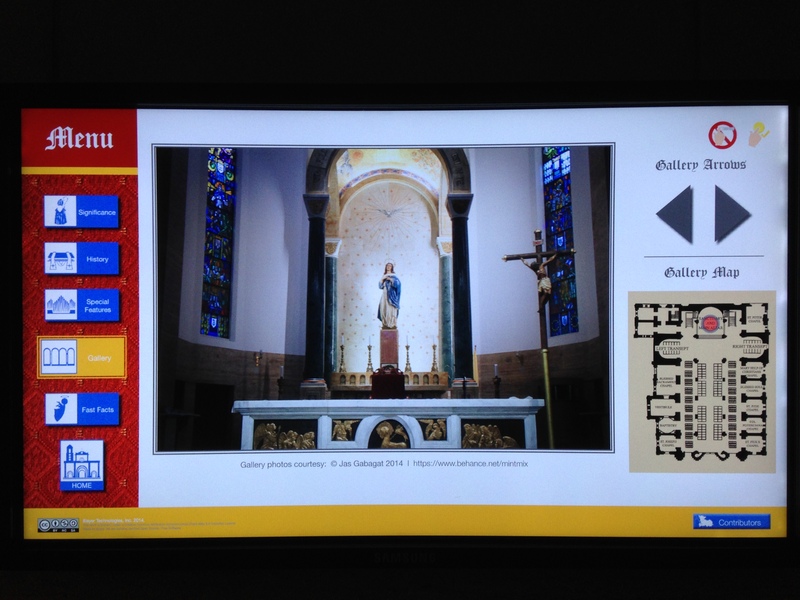 The chapels, as well the Baptistry, are equipped with interactive monitors for a more detailed informations about the cathedral. 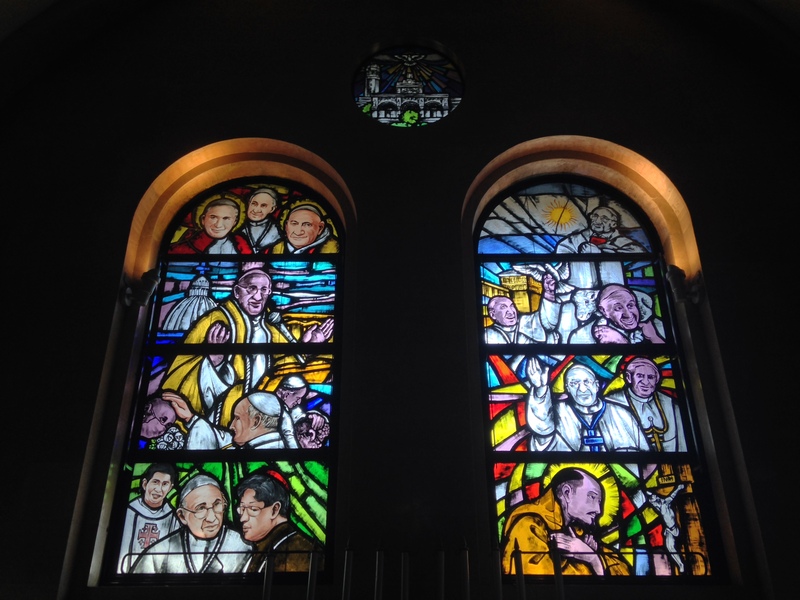 Stained glass details of the recent Papal visit to the Philippines of Pope Francis. 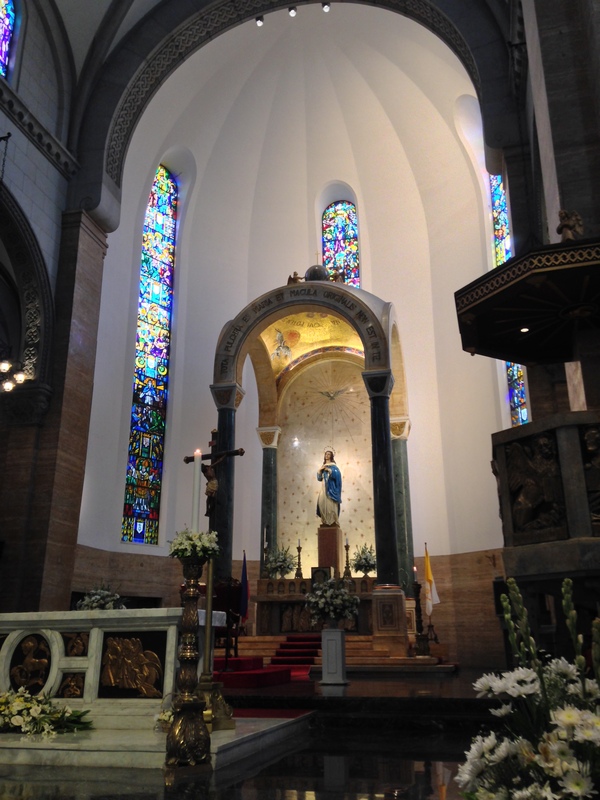 Shot from the Chapel of Mary Help of Christians and Our Lady of the Pillar. 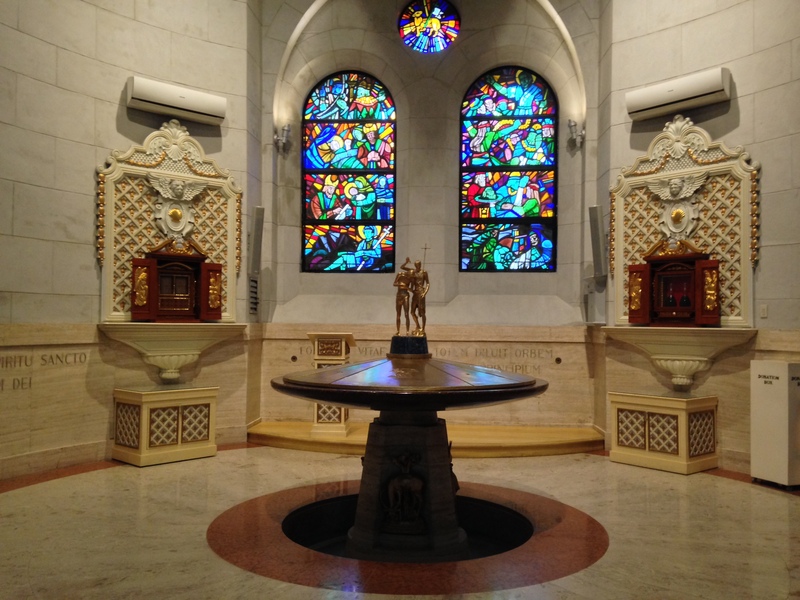 The chapel was designed by the Spanish architect Michele Fisac with the image of the Nuestra Señora de la Paz y Buenviaje enshrined in this chapel. The official coat of arms of the Philippines at the left transept of the cathedral. The center of devotion and veneration in the high altar is the gilded bronze image of Our Lady of the Immaculate Conception, which the Italian Enzo Assenza crafted based on Esteban Murillo’s painting. The Marian image, also designed by Fiedler, is protected by a canopy or baldachino showing beautiful angels venerating the Cross. The column capitals of this canopy portray the olive, cypress, and plane trees to which Mary has been compared according to Liturgy. Great post. I like the historical perspective as well. Thank you, Scott! I’m really glad that you liked it. Thanks, Vince! 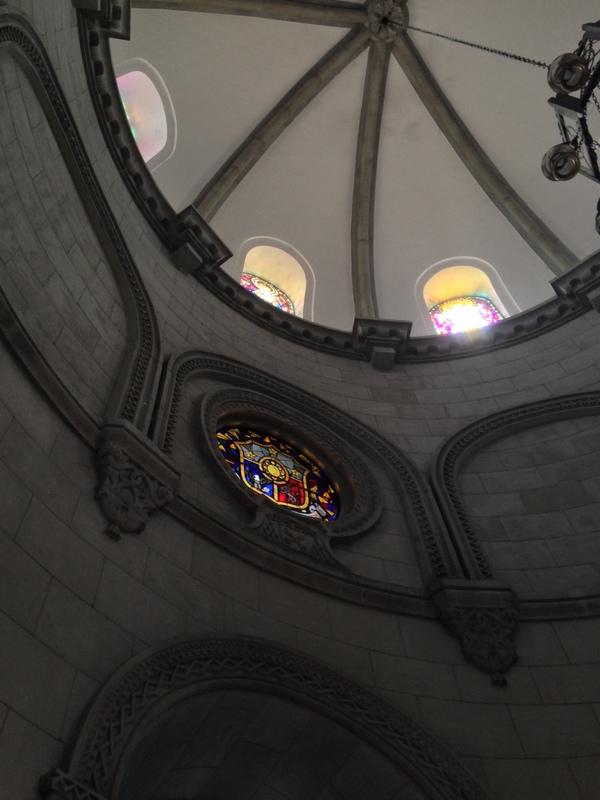 Have you been to Manila Cathedral before?